Plyometric Training For The Upper Body, An Awesome Way To Build Strength, Power, And Explosiveness! Plyometrics is the term now applied to exercises that have their roots in Soviet training methods. This method was originally known as "shock" training and was invented by Yuri Verkhoshansky in the Soviet Union. Interest in this training increased during the early 1970s as East European athletes emerged as powers on the world sport scene. As the Eastern bloc countries began to produce superior athletes in such sports as track and field, gymnastics and weight lifting, the mystique of their success began to center on their training methods. Plyometric training rapidly became known to coaches and athletes as a method of training that linked strength with speed of movement to produce power. The exercises became essential to athletes who jumped, lifted or threw. Unless you live under a log you've probably heard how plyometric training can increase jumping ability, speed and explosiveness. The well known plyometric training methods involve the lower body and the results are often nothing short of miraculous. But not much is written about how plyometric training can also dramatically increase strength, power, speed and explosiveness in the upper body. Up until recently, athletes haven't spent a great deal of time performing upper body plyometrics but I predict this is the training method of the future. Consider one athlete who specialized in this type of training and quickly made a name for himself. Plyometrics ... Strength, Power, Speed! 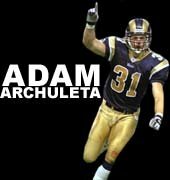 A few years ago it was said that Arizona State linebacker Adam Archuleta had no real shot at playing in the NFL. He hooked up with Jay Schroeder at Evo-Sport, who put him on a program incorporating lots of whole body plyometric type movements to improve his draft status. By the time the combine came around, ESPN's Sports-Center did a little feature because apparently Schroeder's program turned Archuleta into a monster. He benched 225 pounds 31 times in the bench press test and can bench 530 for a max (a record for a defensive back). When Archuleta began the Evo-sport program, he benched 265 pounds in 2.76 seconds. He squatted 273 in 3.47 seconds, ran the 40-yard dash in 4.79, and had a 26-inch vertical jump. Today he is a strong safety for the St. Louis Rams. His personal best in the bench press is 530 pounds in 1.09 seconds and in the squat, 663 pounds in 1.24 seconds. He also has run a 4.37 40-yard dash and jumped 39 inches vertically. This is what is possible with the right training program, of which plyometric training plays a large part. This article will show you several unique ways of building this type of strength, power, explosiveness and speed in the upper body. First I'll talk about how plyometric drills work. Plyometric drills are utilized to bridge the gap between force and explosive power and increase reactive strength. You can think of reactive strength as something like a "spring-like" effect. The drills are performed to develop force by a quick loaded eccentric or negative contraction. This contraction causes a stretching of the tendons and muscles. The muscle/tendon units stabilize this negative force, stores it like compressing a spring and then releases it like letting the spring go. This reflex action ends up being a stronger than normal muscular contraction in the opposite direction. Pick up a ball, any ball, and throw it. Now pay attention to what you naturally did without thinking about it. Did you bring your arm back behind your head and pause and then throw it? I would hope not! Chances are you quickly drew your arm back and let it fly. That is a plyometric movement! The quick rearing back of your arm quickly stretched the muscles, tendons and connective tissue in your shoulders and built up energy which allowed you to throw harder. Would you have thrown as hard if you brought your arm all the way back, paused for 3 seconds and then released the ball? Definitely Not! We all know that you can bench press more weight by using a quick "bounce" near your chest then you can by using a lengthy pause. Why is this? It's because when we quickly reverse direction before pressing, this creates a lot of eccentric force and during this downward movement force is created and energy is stored as the muscles and tendons are stretched, similar to a loaded spring. You can see this even clearer when you watch people jump. One of the reasons most people can jump higher when taking a few steps is because they create more downward force, which can then be utilized to an even greater extent in the jumping phase. Here's another example, picture a bow. In order for a bow to propel an arrow, it first must be de-formed by pulling it in the opposite direction. This creates a buildup of potential energy and upon its release it has more useable kinetic energy. A fully activated muscle undergoing a forced stretch, like the bow example, can increase force in the other direction up to 2 times, but increasing the speed of the eccentric (downward) force can further increase concentric or upward force due to the additional build-up of energy so we also have to consider the speed of these eccentric (downward) forces. You can build up even more useable potential force by increasing the speed of the eccentric (downward) force, so the key is to be able to tolerate high and fast eccentric (downward) forces. The more proficient you are at the ability to build up and stabilize downward energy, the greater the potential end product- in this case, power, explosiveness and avoidance of injury. In order to be very good at this you must be able to be efficient at absorbing lots of downward force and then learn how to advantageously stabilize that force, and then sequence the two together to react to that force with a more powerful concentric contraction. How much weight you lift? How fast you lift that weight? How far you can throw a medium weight implement? How hard you can hit? How high you can elevate your body after a push-off? We can call this entire process your static-spring proficiency, or plyometric efficiency. Realize that in a quick movement such as any sporting movement, strength is useless unless you are able to apply that strength quickly. Plyometric training will help you do just that. Also realize that you can train your body to handle and store higher and faster eccentric (downward) forces and that the ability to do this is correlated well with performance in any plyometric activity and most sports. A perfect way of creating both large eccentric forces and fast eccentric forces is to catch, absorb and stop a falling load. The better you can do this, the more downward energy you can absorb and create into a powerful concentric movement. So how can you implement the catching of a falling load with your upper body and do so without killing yourself? Simple! Use your own bodyweight and perform an upper body altitude drop. Elevate yourself with your arms up in boxes in a push-up position. Drop off the boxes, land on a padded surface on the the ground and attempt to absorb the impact. Bend your arms no more then ¼ range and do 3-4 reps of this per set. Never increase the box height above the height that allows you to land with minimal arm bend. You will find the better you get at doing this the higher you can raise the boxes. Realize that upon impact in this movement you'll be absorbing nearly 6 times your bodyweight! Not only does this require a strong and quick muscular contraction to stabilize the force, but it also develops your plyometric efficiency. After you have mastered the altitude drop you can perform upper body depth jumps. You do these just like the altitude drops but immediately upon landing you attempt to rebound yourself back up on the boxes with each rep. Try this and see how high you can elevate yourself! It can be fun. I recommend you perform 4 sets of 4 repetitions of each exercise twice per week prior to upper body workouts. Perform 5-10 repetitions per set of each exercise for 3-5 sets each. 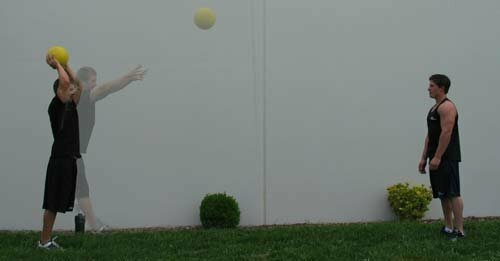 Can be performed by throwing the ball against a wall or with a partner. In a regular pushup position descend down and pause for 3 seconds then attempt to elevate your body up into the air. You can also attempt to elevate yourself on boxes. Perform 4-5 sets of 5-8 repetitions. Use 15-30% of your max weight. Pause for 3-5 seconds in the bottom position then throw the bar up as high as possible and catch it or have a partner catch it for you. Perform 4-5 sets of 2-5 reps. Using 50-85% of your max weight pause in the bottom position for anywhere from 2-8 seconds and then explode the weight up but don't throw it. Perform 4-5 sets of 2-6 reps. These exercises are plyometric in nature but less intense then regular altitude drops and depth jumps. Done rhythmically and explosively simply try to elevate yourself off the ground with each rep. As soon as you hit the ground try to instantly elevate yourself back up. Perform 4-5 sets of 8-15 repetitions. Done just like the rhythmic plyometric pushups but this time use low boxes. Use 15-30% of your max. Don't pause on any of the reps but just continuously throw the bar up, catch it and then throw it up again. Perform 4-5 sets of 5-15 reps. Performed just like the rhythmic plyometric pushups but only descend down ¼ of the way. Perform 4-5 sets of 15-25 repetitions. These are the high-intensity plyometric movements. Always be careful when performing these. Use 50-65% of your max bench press - From the lock-out position quickly drop your arms and let the weight fall. With the weight quickly descending toward your chest quickly try to "catch" and "stop" the weight anywhere from 3 inches to ½ way up. Try not to let the bar come down any further after the "catch". From here explode the weight back up as quickly as possible. Be careful with this and realize it can be very dangerous to remove your hands from the bar unless you have spotters on each side or a specially designed platform! Perform 4-5 sets of 3-5 repetitions. Go ahead and implement some of these exercises into your training. They will work best if also done concurrently with training designed to increase your upper body strength. Plyometric work should be done prior to any strength or hypertrophy training. An easy way to structure your training is to pick 2 exercises and do those 2 exercises prior to other upper body training no more than twice per week. Use the higher intensity methods such as altitude drops, upper body depth jumps and reactive rebound bench presses for no more than 3 weeks at a time. For the next 3 weeks pick 2-3 of the lower intensity methods. You will find alternating the intensity every 3 weeks like this will lead to the best results. Optimizing Muscle Size Through Different Training Methods!